Thousands of people lined up for blocks outside the U.S. Capitol to say goodbye to Senator John McCain as officials, relatives and friends paid tribute to the Vietnam hero and longtime senator lying in state under the majestic dome. President Donald Trump was absent from the event, at the McCain family’s request after an extended feud between the two. Family, friends and a roster of current and former Washington officials are paying tribute to John McCain at the Capitol. Vice President Mike Pence was joined by top White House officials including Defense Secretary Jim Mattis, Chief of Staff John Kelly, National Security Adviser John Bolton, Attorney General Jeff Sessions, and Deputy Attorney General Rod Rosenstein. Military brass included members of the Joint Chiefs of Staff. Former Secretary of State Henry Kissinger, former Connecticut Sen. Joe Lieberman and actor Warren Beatty are among those pausing at McCain’s casket as the senator lies in state under the dome. Senate Majority Leader Mitch McConnell and Speaker Paul Ryan delivered remarks. Democratic leaders Nancy Pelosi and Chuck Schumer were flanked by scores of lawmakers, including former prisoner of war, GOP Rep. Sam Johnson of Texas. At a memorial service in the Capitol, Vice President Mike Pence says John McCain will be missed and that President Donald Trump respected the late senator’s service to the country. The vice president closed his remarks in the Capitol Rotunda by echoing the senator’s own words for how he once said he wished to be remembered. McCain is lying in state on Friday. A public viewing will be held in the afternoon. A memorial for John McCain is underway at the U.S. Capitol where elected officials, family and friends are gathered in the Rotunda. He described “the cocky, handsome Naval aviator who barely scraped through school, but then fought for freedom in the skies” and “who became a generational leader” in the Senate. Vice President Mike Pence greeted John McCain’s mother, Roberta McCain, in the Capitol Rotunda ahead of the senator’s memorial service in the Rotunda. Pence is filling in for President Donald Trump, who was not invited by the McCain family for the services this week honoring the Republican senator. He attended with his wife, Karen. The vice president is among several officials who are expected to deliver remarks. 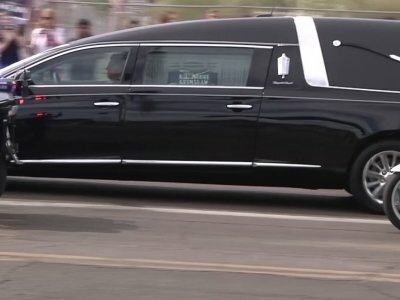 The hearse carrying the casket of John McCain has arrived at the Capitol as a memorial begins for the Republican senator. McCain’s wife, Cindy McCain, and other members of his family watched from the steps of the East Plaza as his casket was carried into the Capitol. Family, friends, lawmakers and other guests, including some celebrities, gathered in the Capitol’s Rotunda for the service. Congressional leaders are expected to deliver remarks. It’s the first of two days of services honoring the Arizona senator in the nation’s capital where he served for more than 30 years in elected office. It’s Washington’s turn to say goodbye to the late Sen. John McCain. And McCain is saying farewell — his way. The six-term Republican senator from Arizona, who lived and worked in the nation’s capital over four decades, will lie in state under the U.S. Capitol rotunda Friday for a ceremony and public visitation. On Saturday, McCain’s procession will pause by the Vietnam Memorial and head for Washington National Cathedral for a formal funeral service. At McCain’s request, two former presidents — Barack Obama and George W. Bush — are expected to speak there.